I saw a guy selling brooms on my way to the light rail station today. 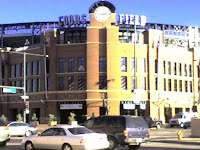 A little hint: he was a few blocks away from Coors field. You probably do not need it, but here is another hint: the Rockies play the Diamond backs tonight. The Rockies are up 3 - 0 in the series and will probably sweep the Snakes tonight. This guy was selling used brooms. I sort of think maybe letting people into a packed stadium with sticks might not be a great idea. So, I do not know if once you bought the broom if you would have to sneak it in. Maybe security woud look the other way, or maybe brooms are just allowed. Even if it was no problem getting the broom into the stadium, I do not think I would buy a used broom on my way to Coors field. I probably would not even buy a new broom. I probably would not even bring one from home. I hope the Rocks win tonight so that the fans who went to the trouble do not feel foolish. I gave blood this past Saturday. The guy who processed my paper work and the girl who took my blood told me that I am up to 3 gallons with Bonfils Blood Center. They were very appreciative. It made me feel sort of good to hit another gallon milestone. My church has a blood drive 6 times a year and I go whenever I get a chance. I have probably only missed 3 opportunities to give over the past 3 years. So, there are probably some people who give more often than I do, but certainly not many. 6 times a year is the most they will take your blood and I have done it 5 times each of the past few years. At my rate it still takes awhile to get up to another gallon. For some reason, every time I get to another gallon, I picture milk gallons in our fridge filled with blood. It sort of grosses me out. That is a lot of blood. Most people I talk to who have not recently given blood seem to be scared of doing it. I try to explain that it really is not that bad, but most people do not believe me. I actually enjoy giving blood. It makes me feel a bit heroic knowing that I may be saving lives. Actually, in my head, everytime I give blood, I am saving 3 people. That is the number of people Bonfils publishes as people I could potentially be helping. I translate that in my mind from potentially saving to absolutely saving lives. My wife does not give blood anymore because she has had a bad experience. The last time she tried to give they kept jabbing and jabbing and eventually gave up. I guess her veins are a bit difficult to find and tap into because she has had this problem giving blood samples to doctors as well. I think if I had an experience like that, I would probably stop too. But the worst experience I have ever had giving blood was that the snacks were not quite the selection as usual. They have never had trouble finding my veins. I have never fainted or even felt the least bit woozy. Nothing the least bit unpleasant has happened to me while giving. I never even feel worn down or feel I should take it easy the days I give blood. If they let me, I would probably give blood more often. Probably not a lot more often but 7 or 8 times a year. I have heard that it is healthy to give blood on a regular basis. Some of the things I hear sound sort of urban- legend - like, but at least some of them I think are legitimate. The one I can think of right now is that there are studies which show a decrease in prostrate cancer (in men) for those who give blood regularly. So, it is apparently good for my health for me to give blood. But that is not why I do it. I do it for the glory that I have built up in my mind. I am sitting at a silent auction waiting for remainding people to come by and CheckOut. I am also watching GameDay on MLB.com of the Rockies and Philly. They are tied 1 to 1. It is a good thing I am able to use my phone as a modem because people are really interested in the game, and it is easier to tell exactly what is going on from the real MLB site rather than the mobile site. I am glad I got the ability to use my cell phone as a modem because it adds allows me to do stuff during the slow times of these darn things. It is weird how many more Rockies fans there are now that they are in the playoffs. I have probably written that before in this blog. In fact, look at me. See how many Rockies blogs I have this year. I have had none in previous years. Now, the Rockies are up 2 games to 0 in the NLDS and are probably the best team left in the NL. It would be crazy to see the Rockies go to the World Series. Auction Automations is getting a bunch of business. This is good. We still do not have employees to run our events. That is bad. I am so tired of doing these events and we are still undercharging. But, we are doing well for a company that I thought would never do much. The guys who do our selling do not have real jobs and do not take into account the fact that the rest of us do have real jobs. One nice thing is that we are using our main competitors to re-sell our solution. They are going to use our software and give us a very nice cute. I love the deal they gave us. Obviously they must think our solution is awesome. The lady who is running this event (The Hispanic Chamber of Education) just told me "You are the best". She was refering to our company because I was able to give her a list of items that were not bid upon. The old-style silent auction was such a pain for her that this thing is a real relief for her. This is like the 10th time tonight that she has told us that we are the greatest or the best or just plain awesome. She loves us. I wish we would have charged her more. Tear down should be pretty easy tonight. I hope. Well, the Rockies won 2-1 and swept the Phillies. Sweat. I need to start helping with tear down. 13 innings into the game, Matt Holiday scored the winning run. He did not touch the plate, but the ump screwed up and called him safe. Rockies win Rockies win Rockies win. And the fans went nuts. And the players went nuts. Holiday was bloody and led off the field, but I think he is ok. The Rockies are playoff bound. And they go into the play-offs winning 14 out of 15, by far the hottest team in MLB. I do not think it is that far fetched to say the Rockies have a chance to go to the World Series. Denver is caught up in the excitement. Talk about a magical run. Hopefully they can keep it going. Wow. It is crowded in Lower Downtown Denver. The Rockies seem to have thousands more fans today than they did just last week. It makes me a bit jealous that all these people get to go to the game and I do not. This is easily a sellout. I have never seen this many people in the 3 block radias around Coors field and the game is about to start so surely there must be even more inside. Anyway, I guess we will have to see how things go. I have a problem with the movie NEXT. I will not Blog specifically what my problem is (in case you have not seen the movie), but the logic of the story is completely flawed. So, I guess that the Rockies were absolutely not out of the race. Somehow, this team has won 13 of the last 14 games to tie for the wildcard spot. Today they play a one - game tie-breaker to see if they are in the play-offs. I do not know how they decided who gets to play this game at home, but it is at Coors field in Lodo Denver, right across the street from where I am working today. I am riding the light rail so that I do not have to worry about parking. I have a feeling that even though this is a night game, parking will be expensive today. And, Lodo will be nuts. I am not a huge baseball fan. There are Rockies fanatics out there who have had to suffer a team that for the past 10 or so years has not finished out of 2nd to last in their division. These fans deserve to get a bit crazy with joy. And they will. And to be honest, this run came out of nowhere. The Rockies seemed better this year and had a couple of decent streaks, but there is no way anyone (except maybe some insane fan) could have predicted such a finish to the season. The whole thing is really remarkable. I hope they win tonight. I hope the Rockies can keep this going for the next couple years.